This post is the second of a series of three posts in which we will overview the basic definitions, yet sometimes not so well applied, of Portfolio, Program & Project management. 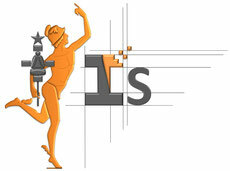 A program is composed of linked activities, including projects. Expected outcomes should be clear but outputs of single activities or projects may not be. Size & reporting aside, organizational change programs are not that different from individual ones.
. Paint one eye of Daruma(*) : Be the one-eyed king in the land of the blind & visualize the goals: for everyone affected, identify gains but don’t forget losses.
. Don’t go there alone: Enlist the stakeholders by building bulletproof case: Avoid the perception gap as they must know what is underway. Address cold-feet attitudes or even opposition with a strong business case.
. Get set: Planning & execution are both sides of the same management coin. A program will not work properly without either of them.
. Be ingenious: The road ahead is littered with risks; so be ready to dodge them.
. Run fast: Despite their undeniable usefulness, control & assurance may limit efficiency if not themselves controlled: They may hinder like the leg braces young Forrest used to have in the 1994 blockbuster. Thus, “sick” programs die, “cured” by forced overdoses of “not-so-critical” matters (rigid reporting, over-engineering …) that block delivering “must-have” ones. 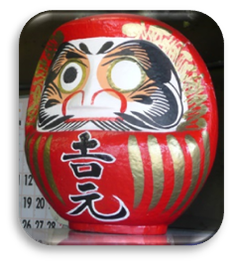 (*): The doll representing Daruma (or Dharma) is a Japanese wishing doll. When bought, both eyes are blank. The first eye is painted by its owner when making a wish; the second is painted when the goal is attained.
. Top-down: A program is like a cam belt, linking the portfolio & strategy to projects & operations. A cam belt is an important motor piece. It synchronizes its different parts, like valves & pistons, to avoid overheating the motor.
. Bottom-up: A program acts like a funnel, selecting key information to be brought to top management. Programs are difficult activities to manage. Indeed, programs are at the confluence of two streams: Strategy is mainly outward-driven while operations are mainly inward-driven. They both merge at program level and, like in the “tug-of-war” game. It takes organizational constraints & conflicts to their maximum. A decade for a program can be quite common in some industries. Due to this length, people wrongly tie program décisions to the operational organization needs (resources, geography …), taking means for an end. So, chop change; size it to a human scale; find early wins to get converts & quiet opposition; build sub-goals to demonstrate progress; & link the timescale to business reporting. The secret of a successful program management is to keep your hands on benefits, communication, performance & risks. Failing to do so will unsettle the organization and your program will soon look like Dr. NicePlan & Mr. NastyExecution. Everything is very open with a clear clarification of the challenges. It was definitely informative. Your site is extremely helpful. Thanks for sharing! I'm pretty pleased to discover this page. I need to to thank you for your time for this wonderful read!! I definitely appreciated every little bit of it and i also have you book-marked to see new stuff on your blog. What's up, everything is going perfectly here and ofcourse every one is sharing data, that's actually excellent, keep up writing. Your mode of describing everything in this article is genuinely good, every one be capable of effortlessly understand it, Thanks a lot. Hello there, You have performed a fantastic job. I will certainly digg it and individually suggest to my friends. I'm confident they will be benefited from this site. Your means of explaining everything in this paragraph is genuinely nice, every one be able to simply know it, Thanks a lot.